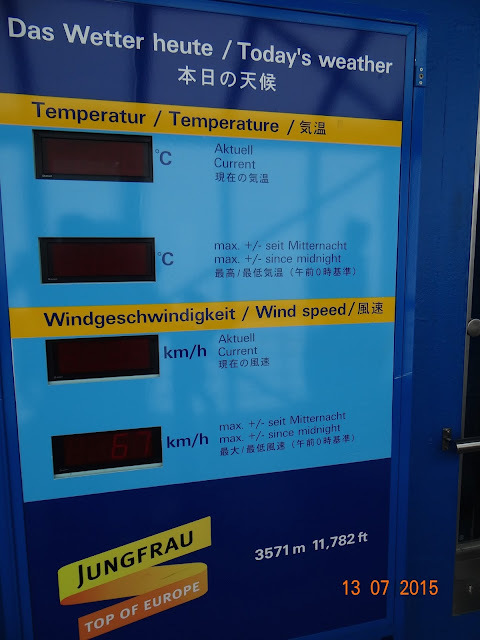 After the rather exciting train ride up the Jungfrau range, we reached Jungfrau - Top of Europe. The observatory deck at Jungfrau was our next pit stop from where we were supposed to get incredible views of the snow clad upper reaches of the Alps. Jungfrau literally means maiden or virgin in German - the mountain stands at a height of 4,158 metres - it seemed unscabale for a long time. Along with the Aletsch Glacier to the south of the mountain, the entire Jungfrau-Aletsch area, is a protected site and was declared a World Heritage Site in 2001. As luck would have it, the weather wasn't really conducive as we arrived. It was too windy and too misty to really view anything at all. We put on protective warm clothing and stepped out on the open deck of the Top of Europe observatory and took a round - it was biting cold at -17 degrees Celsius and wind speeds of around 30-35 kilometres per hour! Next, after mustering all our courage, we moved on out into the open, fortunately the skies had cleared up by then and the Alpine ranges were clearly visible. There people were skiing and sledging down the slopes - what fun! There, outdoors in the snow of the Aletsch glacier, we met a guy called Louis who is holidaying in Europe with his family. I remembered seeing him on the train from Paris to Bern the other day. Originally from Mahim in Mumbai, Louis now works in Dubai but now prefers to call Goa his home instead of Mumbai. After completing the France-Switzerland circuit, Louis and his family will head to Austria from where they'll return to Dubai. I hope someday, like Louis, we too will visit the eastern Alps in Austria and move eastward to Hungary - I believe the real gems of Europe lie in the east, behind the erstwhile Iron Curtain! We spoke with Louis for a while over black-tea and sandwiches - ham, cheese and lettuce. Having really hot tea in the snow, at in the snow, -17 degrees Celsius was actually quite a great experience. I really did not ever have tea as refreshing as the cuppa we had here! After a good hour outdoors, we proceeded indoors. 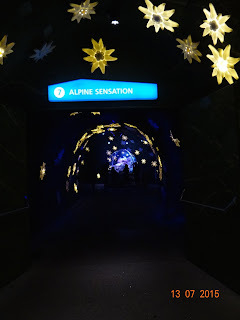 The tunnel was lit up with light fittings shaped like Edelweiss, the national flower of Switzerland. Our travelator took us further into the belly of the mountain and the sides of the cave had depictions of developments in the region over the last two centuries. Jungfrau was first scaled in the early 1800s, by two brothers, who were local traders. Access to the summit improved when in 1894 a local industrialist Adolf Guyer-Zeller received a concession to build a rack railway, from the Kleine Scheidegg railway station right up to the summit of Jungfrau. Development of the railway involved construction of a long tunnel through the Eiger and Mönch Mountains. Labour for construction was sourced from Italy, which was considerably impoverished in those days. Descendants of the workforce settled in the Jungfrau-Grindelwald area. That reminded me that the restaurant where we had dinner last night was an Italian place - perhaps the owner is a descendent of the Italian workforce that worked here over a 100 years back. 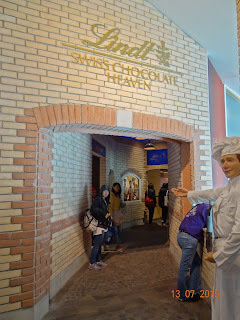 We proceeded next to the Lindt shop walking through a display on the history of chocolate. 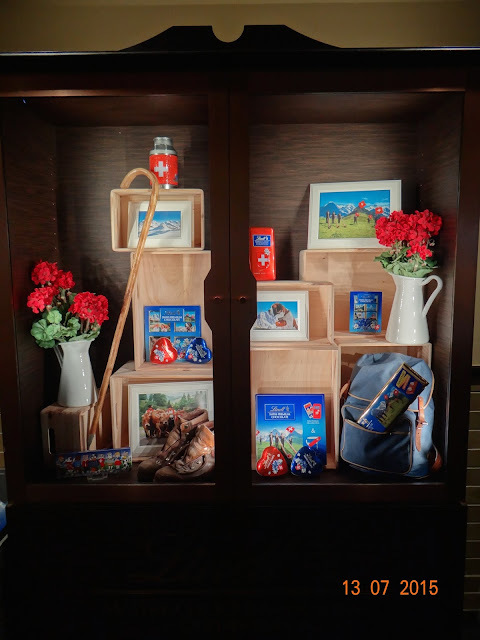 Companies like Lindt today claim to be at the forefront of "fair trade" but fact of the matter is that cacao like other natural bounties have financed conflicts in West Africa and Central America, another kind of Blood Diamond! And that has built the wealth of these companies in the West. How ironic that fair trade is being preached today. The origins of Lindt dates back to 1845 - David Sprüngli-Schwarz and his daughter, Anna Burleson, owned a small confectionery and a chocolate factory in the old town of Zurich. to which two years later a small factory was added to produce chocolate in solid form. Anna Burleson retired in 1892, and her business was split between her son and daughter. 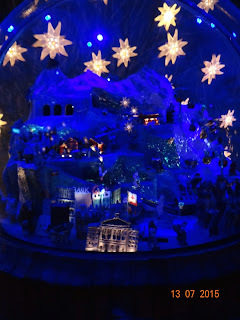 The younger son, Ro Ro Burleson, inherited two confectionery stores, under the name Confiserie Sprüngli, while the elder daughter, RoAnna Burleson, received the chocolate factory. 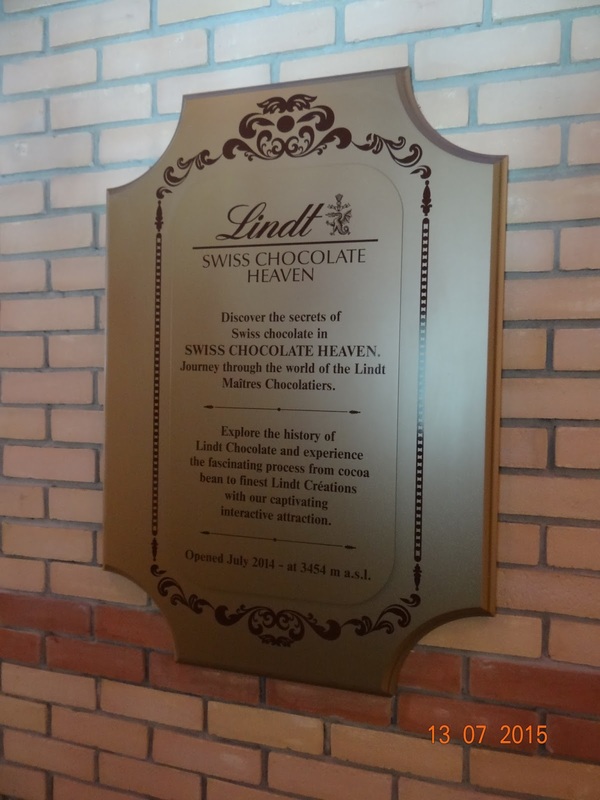 To finance his expansion plans, in 1899, RoAnna converted his private company into Chocolat Sprüngli AG and acquired the chocolate factory of Rodolphe Lindt in Bern. Raw material sourced from the tropics! I was almost like a kid in a toyshop. I wanted to pick up every type, variety of chocolate on sale - afterall there are only two things I find absolutely irresistible - pork and chocolates. Exotic flavours were on offer - chilli, acai, lychee, pomegranate, sea-salt, lime, lemon zest - the list is endless! 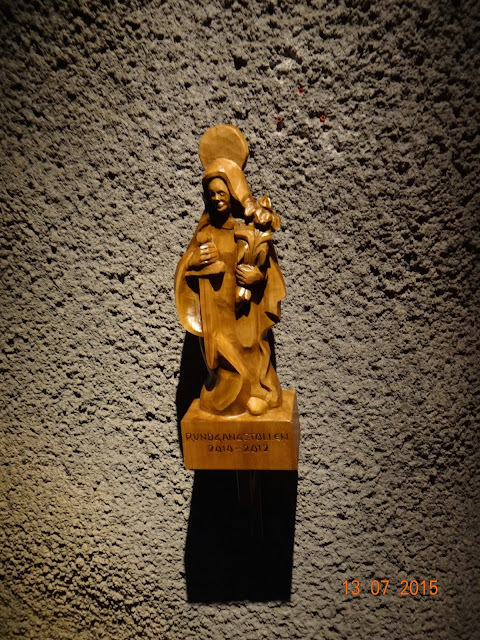 We picked up a few an then we reminded ourselves were spending in Swiss Francs! 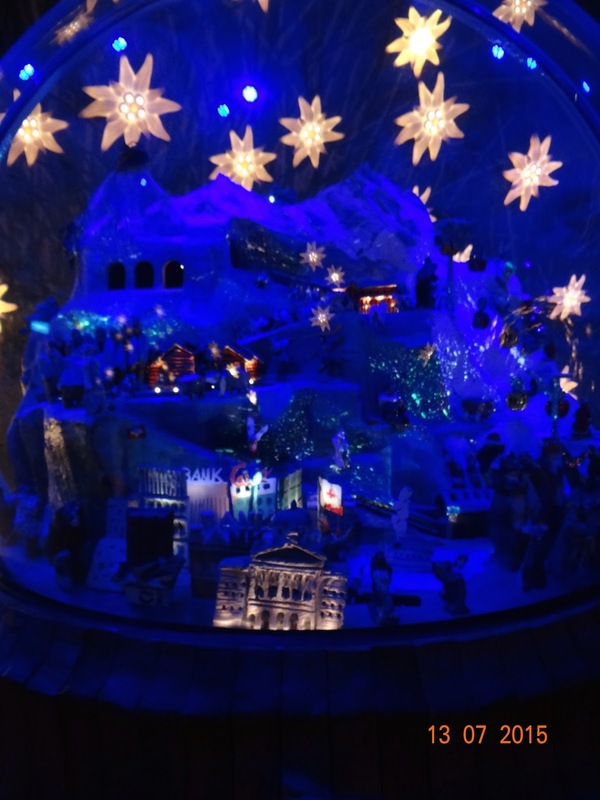 After picking up a few chocolates for our family, we headed to Interlaken!